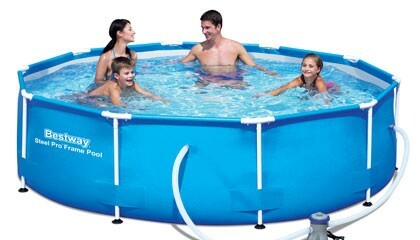 Normally caused when the pools have not been set up on flat and level ground The pool will need to be disassembled and erected on a flat and level surface. This is not a manufacturing issue. What is a suitable base for the Steel Pro Frame Pool? Almost any completely flat, solid level surface can be used. Do not use sand as leveling material as it is prone to shift under the pool. Do not set up on driveways, decking, platforms, gravel or asphalt. The ground should be stable enough to withstand the weight and pressure of the water. Fill the pool until the water capacity is at 80%. It is recommended to leave some extra space for water displacement for when the pool is in use. We would recommend using chemicals to maintain the health of your water, this will also mean the water wont have to be changed as often. The pools should be cleaned and thoroughly dried before being stored.